There are millions of people struggling with toenail fungus every day. There are a wide variety of treatment modalities which have proven to be not successful in eradicating this infection. The most effective treatments available prior to this new laser treatments, have the potential to cause severe problems with kidneys and the liver. Dr. Kosari is proud to introduce the most advanced treatment modality for this problem: Toenail Fungus Laser Treatment. The laser is a specially designed, patented medical device, that shines through your toenail and vaporizes the pathogens embedded in your nail bed and nail plate that cause toenail fungus. 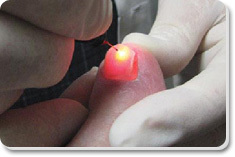 The laser light beam does not harm the nail or surrounding skin. The treatment is painless, so there is no need for anesthesia. Our clinical studies to date reveal that over 88% of treated patients show significant improvement. In most cases, fungual nails are completely cured! It takes approximately 10 minutes to treat a big toe and up to 45 minutes for all toenails. 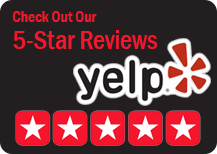 The vast majority of our patients require only one treatment. This is NEW laser technology and has only recently become available to the public. Currently, it is the only laser treatment available in the world for toenail fungus infection. YES! The treatment does not harm you in any way. You will be able to walk out just as well as you walked in. You can wear shoes and even get a pedicure after treatment! Laser treatment is considered aesthetic and therefore is not covered by health insurance plans; however, laser treatment is affordable. The cost for many patients is LESS that expensive prescription medications they have tried in the past, often without success. We offer several payment options, including INTEREST FREE FINANCING FOR ONE YEAR (ask for details). My staff is happy to answer any questions you may have. In our clinical studies, there have been no adverse reactions, injuries, disabilities or know side effects. As you may know, oral medication available today for treatement of fungal nails, carries with it possible serious health risks (commonly the liver and kidneys). The laser treatment does not. On average, a toenail will replace itself every 6 to 9 months. Healthy new growth should be visible within the first 3 months as your nail continues to grow. HOW CAN I PREVENT FUNGUS FROM COMMING BACK? You must practice prevention. That means applying antifungal medication to feet on a daily basis for the rest of your life! Also treating your shoes. Ask Dr. Kosari for the best methods of prevention of onychomycosis.